This post has been contributed by Dan Straker, Dipl. Tech., B.A., Co-Existing with Coyotes Coordinator with the Stanley Park Ecology Society (“SPES”). I have been following SPES since I moved into the West End almost eight years ago and I recently became a member. I wanted to offer the team an opportunity to share their news, events, and work so I have created “SPES Saturday” where they will be contributing stories with my audience once a month. If you’ve been in Vancouver for the past couple weeks, you’ve probably noticed that summer is in full swing. There’s never been a better time to cool off in the shady forests and beaches of Stanley Park and learn about some of the amazing wildlife that live in them, many of which are doing their best to keep cool themselves. Join our Beavers, Brooks, and Bogs* walk (Sunday July 21 from 1:30pm to 3:30pm) and learn about the wetlands and streams around Beaver Lake that play such an important part in the local ecosystem, providing clean water and a safe place to call home for many species of plants and animals, including our very own beavers. A Beaver at Beaver Lake in Stanley Park. Photo credit: Mark White. Beaver Lake is now home to five beavers that work tirelessly in hopes that they will keep the water level in Beaver Lake high enough for the winter by damming the flow to Beaver Creek. Beavers love lakes and are natural ecosystem engineers. 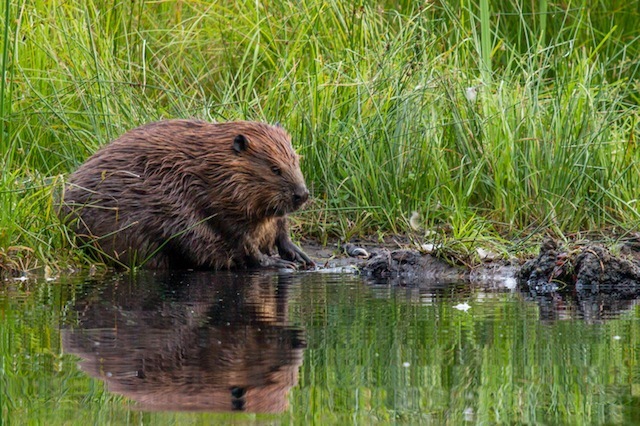 In fact, beavers are the only animal other than humans that have built a structure that is visible from outer space! They work so hard because they need an aquatic environment to store their winter food, which mainly consists of the outer layers of woody branches and trees. That way, when the lake freezes and they are sitting cozy in their lodge, they can use their secret underwater passage and grab a quick snack from the bottom of the lake without having to expose themselves to predators or having to spend a lot of energy, much like a squirrel stores nuts for the winter. If cooling down in the shade of the forest isn’t for you, you can always head to the beach instead and find out how intertidal creatures keep cool. There is a whole world waiting to be discovered that you can only see for a few hours a day while the tide is out. If you’ve ever wondered where beach crabs come from or how seaweed holds on without roots, you’ll find out on our Life at the Beach Walk (August 4th from 11:00am to 3:00pm, free to drop in). Maybe you just want to be cool, like the bald eagles of Stanley Park, which know a thing or two about playing it cool. We now have five nesting pairs of bald eagles in Stanley Park and I don’t think anyone can deny that they are one of the ‘coolest’ animals around. With the help of volunteers, SPES monitors bald eagle nests all over Vancouver, read our June update to find out the locations of these nests in the Park. Currently the young eagles of the Park are learning how to fly and hunt, and they better learn quick too, since they and their parents will soon leave their nests behind in search for better hunting grounds at the end of July and early August. They will be looking for tasty salmon and won’t return to the Park again until October. Join SPES for a walk and talk all about Stanley Park’s Eagles* (July 14 from 1:30pm to 3:30pm). *Nature Program Fees: $5 for SPES members, children and seniors. $10 for non-members. We recommend pre-registering for programs due to popularity of our programs. For more information on SPES events, please visit our events calendar.